Maryland doom collective GATEWAY TO HELL will unleash their debut EP, Clovers, via Unholy Anarchy Records later this month. Today, The Obelisk is streaming “Tin Roof,” from said EP at THIS LOCATION. If you missed it, check out the title track at the GATEWAY TO HELL Bandcamp page at THIS LOCATION. The five bottom-heavy ragers comprising Clovers were captured at Developing Nations with Kevin Bernsten on their home turf and douses its listeners with heavy riffs, an exceptional vocal attack, and sheer, unrepentant catchiness. The Baltimore four-piece conjures loud music about things that matter. Whether it’s a slow burning, existential lament or a fast-paced scorcher about regrettable, late-night, drunken food orgies, GATEWAY TO HELL, fittingly self-described as a, “groovy, ghoulish mix of doom metal and the laughter of ugly children, with a touch of inebriation and shame,” draws influences from all over the musical spectrum including Deep Purple, Danzig, and of course, Black Sabbath. 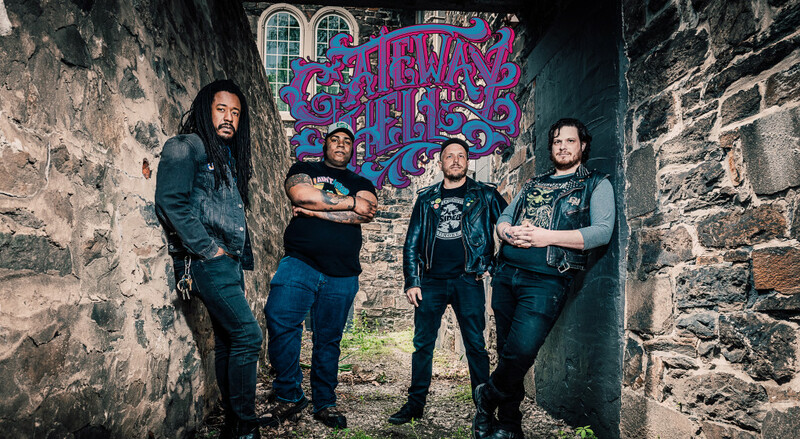 GATEWAY TO HELL was forged in 2013 when drummer Dan Petruccelli and bassist Rudy Gomez started jamming in the basement of an otherwise reputable Baltimore cake shop. Taking cues from John Carpenter soundtracks, Type O Negative, and Ministry, they realized they were onto something fun and brought in Jerrod Bronson on vocals and Jo K on guitar to complete the initial lineup. The band released a self-recorded demo in October of 2014 and shows with the likes of The Skull and Crypt Sermon ensued. By 2015, Gomez moved to Austin, Texas but remains an integral part of the band as the painter responsible for much of the band’s artwork. Eric Smythe was brought in on bass and later Alex Briscoe joined as a second guitarist. Together, they played shows regionally opening for Valient Thorr, The Bronx, Mac Sabbath, and Mondo Generator. In the spring of 2016, they recorded the soon-to-be-unleashed Clovers EP featuring five songs of atmospheric and crushing metal that fuses their many metal and punk influences. Later that year, Jo K. fled the band to pursue new projects. The band remains a four-piece. 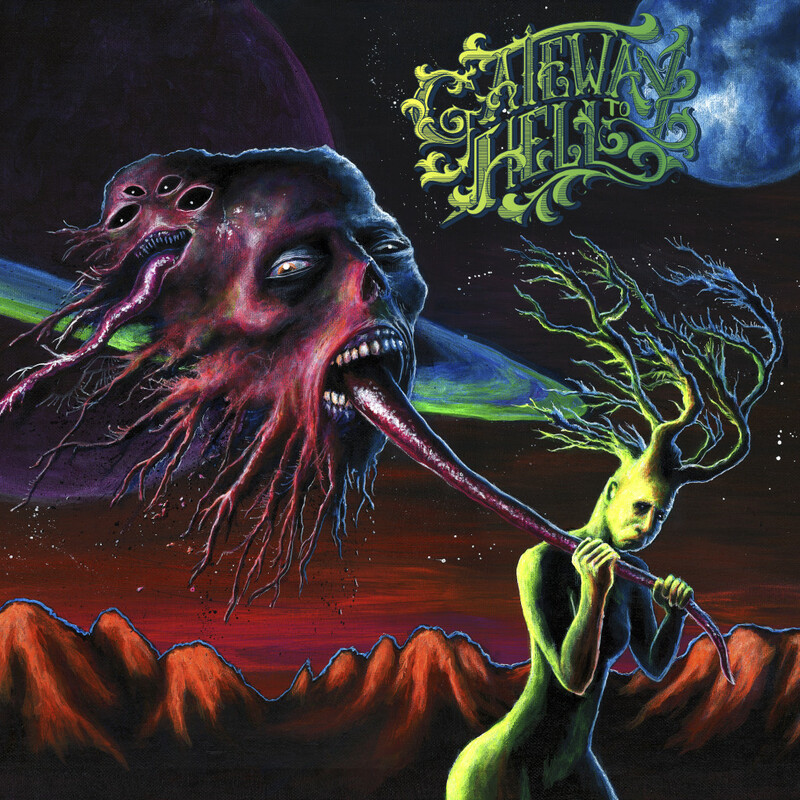 GATEWAY TO HELL’s catalog includes a self-titled demo, one single titled “Scorched Earth,” and their upcoming 2017 debut EP Clovers. The band is currently writing new material for their next album.